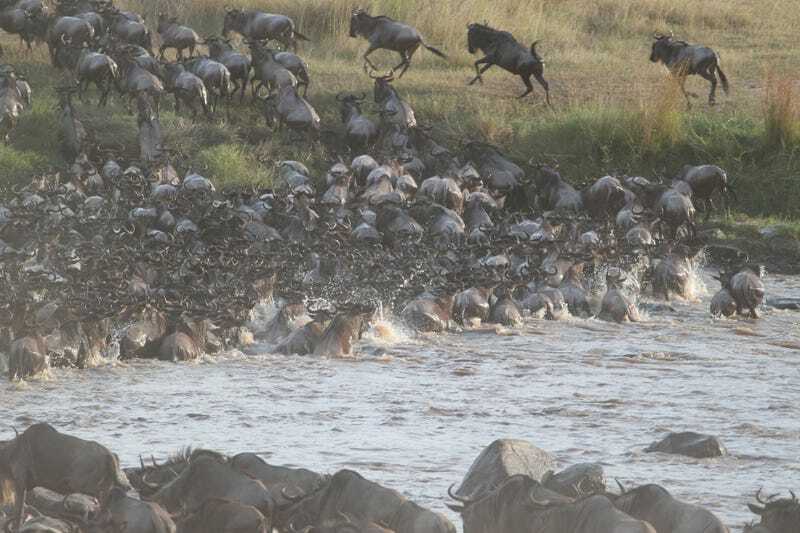 Each year, thousands of wildebeest drown while making their annual migration through the Serengeti. New research shows how the resulting two million pounds of rotting flesh performs a crucial role in maintaining the region’s vibrant ecosystem. In what is the largest remaining overland migration in the world, some 1.2 million wildebeest make the yearly trek across the Serengeti Mara Ecosystem. 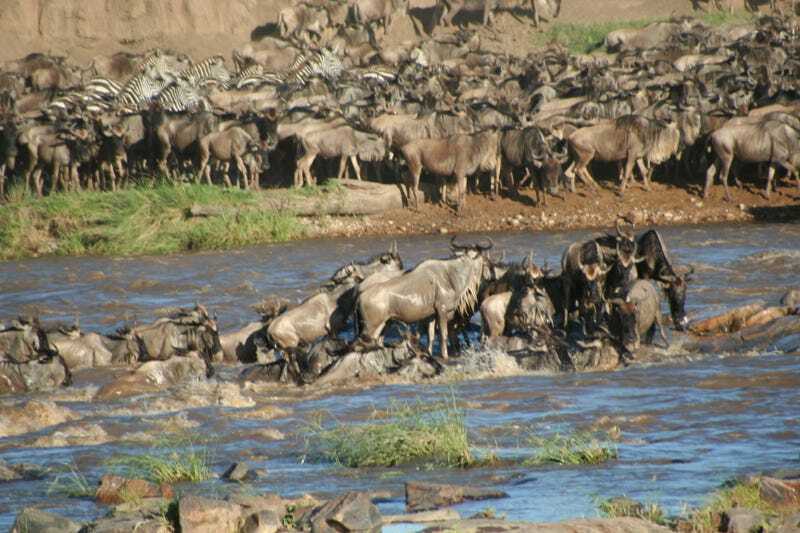 Among the many challenges that await these mammals is the Mara River, which claims thousands of wildebeest each year. Scientists have known about these mass drownings for decades, but no one ever bothered to study the resulting environmental effects in detail. In a new study published yesterday in Proceedings of the National Academy of Sciences, a Yale research team led by ecologist and evolutionary biologist David Post is the first to quantify the frequency and size of the annual Mara River drownings, and analyse the impact these hunks of rotting flesh have on the underlying river ecosystem. As their research shows, mass drownings have happened in 13 of the past 15 years. Each year on average, wildebeest migrations result in 6,250 drownings, introducing 1,100 tonnes of biomass into the river. That’s like dropping 10 blue whale carcasses into a moderately sized river each year. Needless to say, it’s a significant chunk of biomass, and the many scavenging animals who make the Serengeti their home take full advantage. It takes anywhere from between two to 10 weeks for the soft tissue on the carcass to decompose, and about seven years for the bone (which comprises about half of the animal’s mass) to completely break down. That means each drowned animal provides both a short-term and long-term source of nutrients to the river. The wildebeest flesh and bone is consumed by everything from microbial organisms and fish through to scavenging reptiles and birds. Fish in particular seem to benefit the most from these annual drownings; these carcasses produce upwards of 34 to 50 per cent of a fish’s diet in the first 10 weeks after drowning, and between seven to 24 per cent of a fish’s diet when it’s down to the bone.